The conducting of a Recognition Assessment helps you to know where you stand with recognition and reduces all confusion with your recognition practices and programs. This is an onsite and/or telephone meetings with leaders, managers and administrators to evaluate recognition programs and practices. Time length is from 1 to 3 days dependent on company size, complexity of existing programs and number of business divisions and geographic location. Surveys and employee focus groups may be conducted to assist with the evaluation. Within 2 – 3 weeks you’ll have a completed onsite Recognition Assessment conducted, along with a finalized written Recognition Assessment report with a summary slide presentation. Report includes observations and range of scores set against best practice standards, and a list of strategic and practical ideas and recommendations for improving recognition programs and practices. Depending on wishes and location a follow-up onsite meeting, or teleconference, can occur to review and discuss assessment findings and recommendations. To discuss more about the possibility of conducting a Recognition Assessment in your organization, please Email Us . 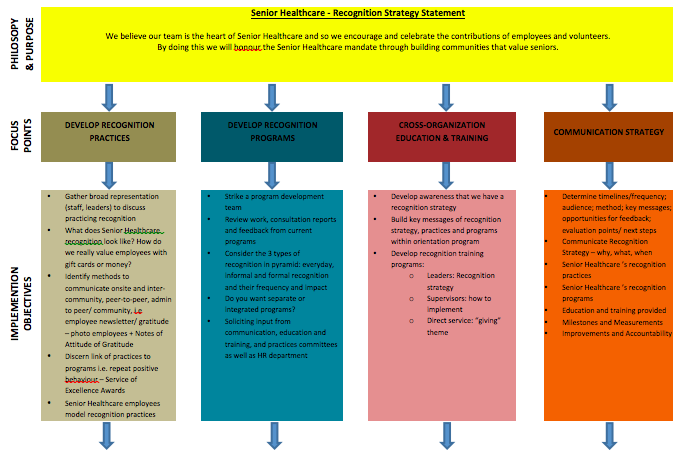 The Recognition Management Institute has researched and developed a Recognition Strategy Model® as a straightforward and easy approach for facilitating the creation of both Recognition Philosophy and Recognition Purpose statements. Using a facilitated process with our proprietary Recognition Strategy Model® our Certified Recognition consultants will guide members of your leadership, management and recognition teams into crafting well-articulated Recognition Philosophy and Recognition Purpose statements. What are our beliefs about employee recognition? Why is recognition important to us? How will our recognition initiatives contribute to our business and to society? What is our purpose for giving recognition? Why are we giving recognition for our employees? Why are we doing recognition for the company? The facilitation of a Recognition Plan can also be developed after the crafting of Recognition Philosophy and Purpose statements. A Recognition Plan can only be developed following the conducting of a prior Recognition Assessment with a completed written report. This allows leaders, managers and administrators to have gap analysis insight, with current strengths and weaknesses, of all reported company recognition programs and practices with recommendations for improvement based on best practice examples. This two-part process is usually completed in a full-day session with a committed group of leaders who want to get recognition right. To learn more about having your own written Recognition Strategy in place, simply Email Us to set up a consultation telephone call. Roy Saunderson can provide your leadership team with the evaluative insights for making your recognition and reward programs up to nominee potential for Recognition Professionals International’s Best Practices Awards. He can assist you with providing strategic and practical recommendations on how to get recognition right for all your internal practices and programs. Roy’s knowledge of behavioral principles for effective recognition, his learning and development skills, along with his experience with helping large, global organizations will be a tremendous asset to getting the business impact you want from your recognition programs. He brings almost 20 years of specialized knowledge and exclusive work experience solely in the field of employee recognition. He has assisted clients with a variety of other services based upon his knowledge and expertise with employee recognition. These services have included developing written online content, video material and design and development of eLearning modules, all focused on giving real recognition the right way wherever you are.